In what some are calling a partisan ploy, a federal judge issued a demand on Tuesday that Justice Department attorneys submit a three-page letter explaining whether they believe courts have the right to strike down laws. Judge Jerry Smith, a Reagan appointee who sits on the 5th U.S. 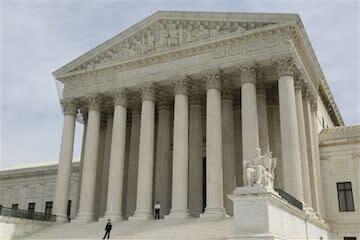 Circuit Court of Appeals, said some unspecified people were troubled that President Barack Obama told reporters earlier this week that it would be "unprecedented" for the "unelected" Supreme Court to strike down the Affordable Care Act. But many Supreme Court experts expressed surprise at Smith's overtly political rebuke of the president. "We respect the decisions made by the courts since Marbury v. Madison," Attorney General Eric Holder said Wednesday, referencing the 1803 Supreme Court case that established the courts' right to strike down laws. "Courts have final say." Holder told reporters that the Justice Department will submit the letter to the 5th Circuit on Thursday. With his comments this week, Obama became the first president to weigh in on a major Supreme Court case after oral arguments wrapped up but before a decision was actually issued, according to University of Texas Supreme Court historian Lucas Powe. He says this is an unprecedented move largely because previous presidents didn't have the opportunity to do the same thing. Franklin D. Roosevelt hung back while judges were deliberating his cases—though he criticized them after they ruled—for fear of being labeled a dictator. (Roosevelt eventually threatened to get Congress to pass a court-packing law, and two justices became friendlier to his laws.) And Chief Justice Fred Vinson (falsely) assured Harry Truman that the court would not strike down his seizure of the steel industry, convincing the president not to pursue any public arm-twisting. Smith told Justice Department attorneys on Tuesday that Obama's comments "troubled a number of people who have read it as somehow a challenge to the federal courts or to their authority or to the appropriateness of the concept of judicial review. And that's not a small matter," he said. Justice Department lawyer Dana Kaersvang replied that Marbury v. Madison is law, but Smith was not deterred. John Jeffries, the former dean of the University of Virginia School of Law and constitutional law professor, told Yahoo News in an email that he finds Smith's behavior "odd." "I know and respect Judge Smith. ... But I am surprised to see a request to the Justice Department asking them to explain their views on judicial review," said Jeffries, a former clerk to Supreme Court Justice Lewis Powell. "My position would be that judicial review is judicial review, whether you like it or not." Other scholars concurred. University of Chicago professor Geoffrey Stone told Yahoo News in an email that Obama wasn't actually questioning judicial review, but was cautioning the judges to remember the other branches of government. "Judge Smith's response was, in my view, quite inappropriate," he said. "It was an unmistakably political act that was well beyond the proper bounds of the judicial role." And Vanderbilt law professor Brian Fitzpatrick, a former clerk to Justice Antonin Scalia, told Talking Points Memo that though he doesn't think Obama's bellicose statements are particularly accurate, "the president is a politician. He's allowed to be cute. Federal judges are supposed to be above that." But the attorney general under George W. Bush, Michael Mukasey, defended Smith on Fox News Wednesday. "When the president calls [judicial review] into question, the court has, it seems to me, every obligation to sit up and take notice," Mukasey said, according to the Hill. Several Republican senators have called Obama's initial comments "intimidating" to the court. The president, a former constitutional law professor, later clarified his statement, saying he didn't mean that it would be unprecedented for the Supreme Court to strike down a law it finds unconstitutional. "The point I was making is that the Supreme Court is the final say on our Constitution and our laws, and all of us have to respect it, but it's precisely because of that extraordinary power that the court has traditionally exercised significant restraint and deference to our duly elected legislature," he said. Obama mentioned that the Supreme Court has deferred to Congress on national economic regulation for 80 years. According to Jeffries, it's not unusual for a president to rail against the court. "I am sure that many presidents have inveighed against judicial actions, and some of them meant it," he said. "Think of Andrew Jackson. In general, such remarks are of no consequence to life-tenured judges. That's why they have life tenure." What's more unusual, according to Powe, is for a federal judge to actually take the bait. Of course, Obama's relationship with the Supreme Court has been unusually tense. In his 2010 State of the Union, he publicly and unprecedentedly rebuked the justices—who were sitting uncomfortably in the audience—for their ruling on Citizens United. Justice Samuel Alito mouthed "not true" when Obama said the ruling would allow foreign corporations to spend in American elections. And so the clash continues, only now it's a circuit court judge issuing a reprimand.